One way to boost connectivity between nations is a FinTech deal. FinTech is one of the four ways Western China and ASEAN can collaborate, according to a keynote address by Ravi Menon, Managing Director of the Monetary Authority of Singapore. He was speaking at the inaugural Singapore-China (Chongqing) Financial Summit themed “Open-Innovative-Connected-Mutual-Strengthen Financial Connectivity to support services along the Belt and Road”. Attended by more than 500 government officials, financial sector professionals and corporate leaders from China and Southeast Asia, the Summit provided an avenue for collaboration on cross-border financial and infrastructure connectivity between Western China and Southeast Asia. One of the dialogues were on innovative cross-border financial services. A fielded topic included FinTech for inclusive development and growth opportunities. Ten Memorandum of Understandings (MoUs) were signed. Two of which were FinTech related. A four-party MoU was signed at the Summit. The MoU will catalyse FinTech cooperation between Chongqing and Singapore. Detailed in the MoU are enterprise and talent exchange, the establishment of an incubator platform and a regular communication mechanism. Separately, an MoU between OCBC Bank, Xiaomi Inc, and Hanhua Financial Holding Co. will be signed. Partners will explore FinTech collaboration in retail and institutional financial services in China. Through this collaboration, more than 300 million Xiaomi retail customers and business partners will have access to innovative financial services. Connectivity between the regions are important to strengthen trade and investment connectivity. Over the years, trade and investment linkages between China and ASEAN have been deep and continue to show signs of growth. On average, bilateral trade between China and ASEAN has increased by 13% p.a. since 2005. China is also ASEAN’s biggest trading partner and its third-largest source of foreign direct investments. Deeper collaboration among China and ASEAN are important to ride against the waves of external trade protectionism and sustain Asia’s dynamism and long-term growth. A potential application of technology solutions as suggested by Menon is along the Southern Transport Corridor (STC). 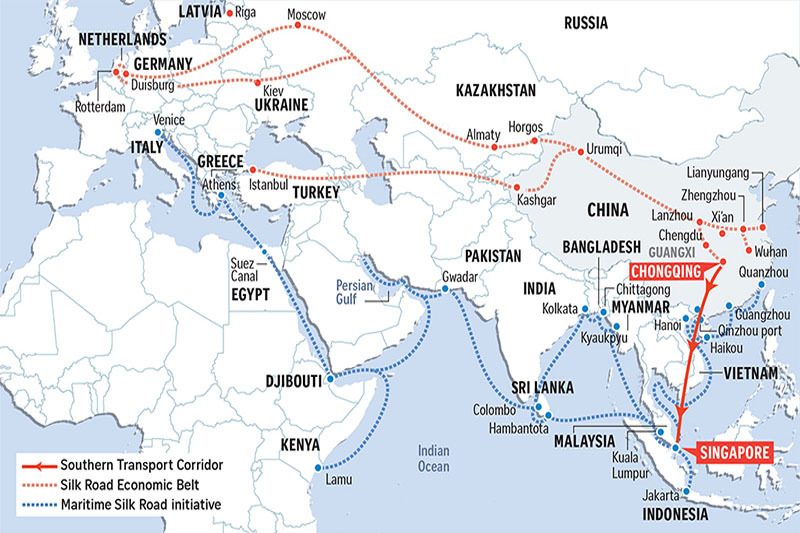 STC is the latest rail-sea transport corridor between China and Southeast Asia. By connecting Western China and Southeast Asia, the STC can potentially shorten the time taken to transport goods between China and ASEAN to one week. This is compared to a two to three week wait period when using other routes. Time saved will have spill over effects into raising the level of trade and investment activities between the regions. Despite the new shortened route Menon is insistent that the trade processes should be as smooth as possible. Currently, logistics are hindered by customs, trade documents handling, fraud checks in trade finance and ensuring goods are delivered timely and without damage. Menon said friction downstream is because of manual and paper-based approaches to trade and trade finance. FinTech applications are a good solution to make the STC hassle free, safe, and cost efficient for all stakeholders, said Menon. Chongqing will be developing a FinTech experimental and demonstration zone in the Western Region. Calling it timely, Menon believes such a zone can serve as a source of technology solutions for the successful development of the STC. Currently, several players have embarked on initiatives in this area. One company uses a cloud-based platform to sync and share information across various parties from trade, logistics and supply chain. An ecosystem of stakeholder is built, and cross-border trade becomes simplified.